As the crowds cheered, American-born Meghan Markle arrived at St. George's Chapel. In the car with the bride were her best friend's 7-year old twin sons. And then the moment millions had been waiting for…the wedding dress revealed. And it didn't disappoint. Meghan Markle chose a classic silk dress with an open bateau neckline and three-quarter sleeves by British designer Clare Waight Keller. Keller is the first female artistic director of French fashion house Givenchy. "I was completely blown away by the dress and it was nothing like I was expecting. I was expecting beads, small pearls exuberance," says fashion expert Tim Gunn. "This was a sculptural masterpiece. I have chills just talking about it …An instant icon." The 16-foot veil, also designed by Keller, featured the distinctive flora of each of the British Commonwealth countries. "It was embroidered by hand…hundreds of hours of hand work was done on this veil," fashion designer Reem Acra explains. The soon-to-be royal was wearing a sparking tiara borrowed from the Queen's collection. "She was wearing Queen Mary's tiara and it's an intricate bandeau and it sort of bends in the middle with a broach in the center," says Ingrid Seward, editor-in-chief of "Majesty Magazine." All of Britain was wowed. Americans were just as dazzled. "When you see Harry's face, when he looks at her he looks at her with love and affection. And this dress symbolizes the whole look…this affection, this simplicity, the purity of love between them," says Acra. "Today, Meghan Markle has redefined what a princess could be," says Gunn. And then as the orchestra played and soloist Elin Manahan Thomas's voice soared through the chapel. In a break with tradition, Meghan Markle began the walk down the aisle alone. Trailing the bride was the bridal party. Meghan chose not to have a maid of honor in order not to have to choose amongst her friends. In keeping with a typical British wedding, the bridal party was made up of children under the age of 11. Harry's nephew Prince George was a pageboy and Princess Charlotte a mini-bridesmaid. Their new baby brother, Prince Louis, remained at home. Prince Charles, stepping in for her father, met Meghan at the choir to accompany her to the altar. "I love the moment when Charles took her up the aisle. It was the Windsors validating Meghan," says Tina Brown, author of "The Diana Chronicles" and "The Vanity Fair Diaries." Looking on were the small number of celebrities invited; Sir Elton John, Serena Williams, the Beckhams, Oprah Winfrey, George and Amal Clooney and members from the cast of "Suits." There were no heads of state in attendance and the few royals invited were mostly from Prince Harry's family. "By royal standards, is a scaled down wedding … that's what Harry and Meghan wanted," Seward explains. Compared to Westminster Abbey where Prince William and Kate Middleton were married in 2011 in front of more than 1,000, St. George's Chapel is smaller -- more intimate. There were only 600 invited chapel guests. "St. George's Chapel is an extremely fine piece of architecture," says architectural historian Dr. Jonathan Foyle. This chapel—a Gothic masterpiece—is a special place for Prince Harry and the royal family and it's steeped in history and sentiment. "Ten kings are laid to rest in there, which is remarkable," Foyle explains. "Henry VIII -- he's buried under a plain slab in there … And the queen intends to be laid to rest here as well." But the chapel has been the site of joyful celebrations as well. In 2005, Prince Charles and Camilla Parker Bowles had their blessing ceremony here after their civil union…and Prince Harry was baptized here in 1984. "And it probably means something very personal to him that, you know, he began the sacraments in this building," says Foyle. And now, Prince Harry is about to undertake the sacrament of matrimony to Meghan Markle … a commoner with nothing common about her. "I never thought someone I knew would be a future princess," said Jax Tranchida, a sorority sister of Meghan Markle's at Northwestern University. "But if it was gonna be anybody, yeah, it makes sense that it was Meg. …She's beautiful. …She's warm …She's welcoming … I wasn't surprised." "She was always a princess. Meghan was always a princess," said "Suits" director Kevin Bray. Meghan Markle was born and raised in the kingdom of Los Angeles -- royalty only in her child's imagination. Home video shows the 8-year-old pretending to be a queen, wearing a crown and being addressed as "Your Royal Highness" by her friends. Markle's mother, Doria Ragland, is a yoga instructor and social worker. Her father, Thomas Markle, was an Emmy Award winning lighting director. Although her parents split when she was just 2, the family remained close knit at that time. 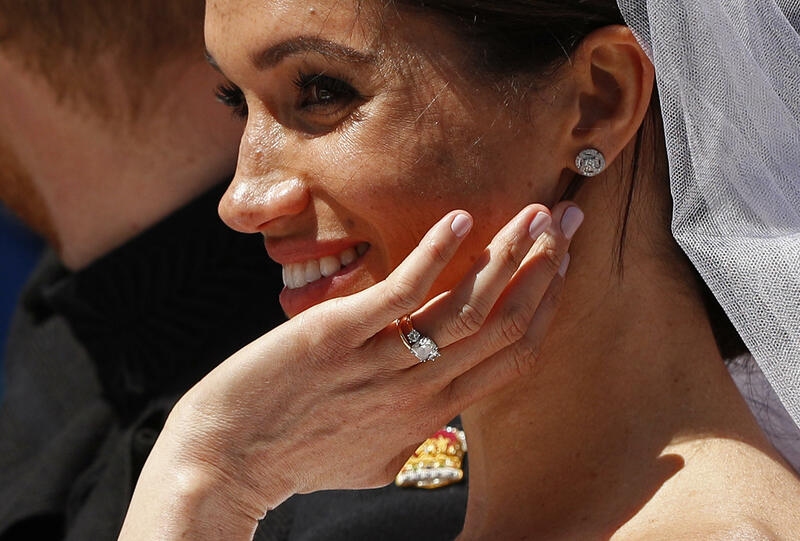 "She never heard her father or her mother say an unkind thing about the other," said Vanity Fair's Sam Kashner, who wrote the first major profile of Markle for the cover of the magazine. Markle's father remained a steady presence in her life while she was growing up. She has joked that she was practically raised on the set of the irreverent sitcom "Married with Children," where her father worked for a decade. "Um, which is a really odd place for a little girl to grow up, let me tell you," Meghan told an audience of AOL's BUILD Series in 2016. But it was not all levity and film sets. Her parents were aware that as a biracial child, Markle might face challenges. So they made her feel special instead of different. "She told a very touching story ... being in seventh grade and having to fill in a box," Kashner told "CBS This Morning" co-host Gayle King. "Caucasian. Black. Hispanic…"
"She didn't know what to check or she didn't want to check," said King. check 'Caucasian' would be a kind of renunciation of her mother and her mother's family." Markle's mother is a descendant of slaves. "And she put down her pencil and she didn't do it," Kashner continued. "Her father said a wonderful thing to her, which I think kind of helped to define her over the rest of her life, he said, 'Well … you make your own box.' That she is who she is and that you are not defined by your race." Kashner said Markle developed a keen sense of social justice at a young age thanks to her mother who would often bring her to feed the homeless on skid row. "She's always been aware of suffering in the world." But the cause that would most shape the future royal were women's equality issues. When 12-year-old Markle was a sixth grader at Hollywood Little Red Schoolhouse, she was struck by a commercial she saw in class. "And a commercial came up for Ivory dishwashing soap," said Linda Ellerbee , then-executive producer and anchor of "Nick News." Proctor and Gamble commercial: "The gloves are coming off—women are fighting greasy pots and pans with Ivory clear." "And this child, this 12-year-old child looked at that and thought to herself, 'That's wrong," said Ellerbee. "It's always 'mom does this and mom does that,'" said 12-year-old Meghan. Young Meghan wrote to Ellerbee. "And in her letter she said after that commercial, the little boys in my class began to tease the girls and say 'See that's all you're good for. That's what girls do. Girls do dishes.'" "They knew it was gonna hurt my feelings," the then-12-year-old said. Ellerbee profiled young Meghan Markle on her show. Encouraged by her father, Meghan had also written a letter to Proctor and Gamble. "So I was wondering if you'd be able to change your commercial to 'people all over America.' Thank you, Meghan Markle," she read aloud on "Nick News." Proctor and Gamble later changed the commercial and an activist was born. "And you can really make a difference for not just yourself but lots of other people," Meghan said on Nick News." "I knew after that story that this little girl wasn't going to change. That she was going to change her world," said Ellerbee. But as Markle sat in front of Buckingham Palace on a trip, she never knew what opportunities her future would hold. "Her heart is so big and so wide and so genuine … And she's also very savvy about how the world works," said Maria Pollia, one of Meghan's teachers at Immaculate Heart High School in Los Angeles. "And I think she loved to rise to challenges," added fellow teacher Christine Knudsen. Markle was a top student, but it was also clear that she had the acting bug. "We all knew she wanted to be an actress … She was in all the plays and in all the musicals," Knudsen recalled. "And you knew also that she had the gift. … 'She's got it. She's got it.'" Markle chose prestigious Northwestern University in Evanston, Illinois, because of its fine theater program. "She was the rush chair the year that I rushed," said Tranchida. "But as the rush chair she's the one who … welcomes you to Kappa. And she opened the door … it's like a ray of light shining from above." "And I just always remember saying that she, like, looked like a princess (laughs) I don't know how else to describe it," says sorority sister Erica Bethe Levin. "She just radiates this, like, ridiculous aura." Sorority sister Payal Adhikari added, "She was very beautiful, but she also seemed really genuine … it never seemed like she was acting the role that she was. It was just who she was." In 2003 Markle graduated college -- the first in her family to do so -- and moved back to L.A. The next year she started dating film producer Trevor Engelson. Just two years later, she landed a gig as a briefcase girl in the NBC game show "Deal or No Deal." Finding good acting roles proved difficult. "She was kind of horrified to read these scripts that she was being sent," Kashner told King. "These parts … they didn't even have names, it was, you know, pretty girl number one." She played the "hot girl" in the 2005 Ashton Kutcher movie "A Lot Like Love." "It was such a short part, but we were so excited, 'cause that was, like, a big deal," says sorority sister Liz Kores Graham. The roles eventually got better, but Markle felt her ethnic ambiguity may have made things more challenging in a label-driven town. But in 2011, the legal drama "Suits" changed everything. Meghan auditioned for the part of Rachel Zane, a paralegal-turned-lawyer that had no assigned ethnicity. "I think the qualities that we were looking for in Rachel Zane were—intellect, beauty, humor, approachability," said Bray. "Meghan was the right person for the job." That same year, Markle married Trevor Engelson in Jamaica, but the marriage crumbled after less than two years. She continued living in Toronto where the TV series is filmed. "She was a lovely, lovely actress. She really kept me on my P's and Q's," says "Suits" actor Wendell Pierce, who joined the cast in the second season. His role would shock some viewers. "It was a bit of a surprise when they brought you in as her father, wasn't it?" King noted. "For some people, I guess," Pierce replied. "…because I thought they didn't know exactly what her ethnicity was. And then you show up and you're the black father!" said King. "Right …that was the reveal." Meghan Markle Characters Unite PSA: "I'm biracial … Some of the slurs I've heard or really offensive jokes or names -- just hit me in a really strong way. …I'm proud of both sides." Meghan Markle, always an activist and now a rising actress, recognized that she now had a platform to effect change. Little did she know that across the ocean, a young prince was being raised with the same drive and compassion and that together, they would make history. Said Pierce, "When I found out about it, I was, like, 'Oh. That's the -- that's the twinkle in her eye. That's the smile on her face,' you know?"